Shree Haleshwor Higher Secondary School was handed over to the school authority on 8th February 2017. The 25th April 2015 earthquake had caused widespread damage to Dolkha district and further damage took place as it was also the epicenter of 12th May 2015 earthquake. 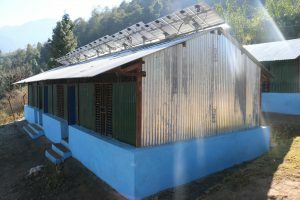 Suri is one of the VDC in Dolakha District with 970 houses consisting 55000 population and 9 schools. Out of nine schools seven schools were damage and destroyed and NJSI has supported the reconstruction and recovery of 4 schools . This VDC is 200 Km away from Katmandu and the access road is very challenging and dangerous. Shree Haleshor Higher Secondary School in Suri VDC, facing the beautiful Gaurishankar range of the Himalayas, was one of the schools NJSI had been supporting with educational materials during the emergency phase and now completed two truss fixed semi permanent buildings. Since the area is prone to landslides it was a very difficult task to complete the repair work of this school. With hard work of NJSI in cooperation with the school management committee, staff and local people the repair work was completed. The handing over ceremony was held in the school premises with the morning assembly of the students, On this awaited day members of the School Management Committee, Teachers, Parents and students were gathered to express their gratitude to NJSI. The NJSI staff and the invited guests were welcomed by children with welcome songs and cultural dances. Fr. Bonyface Tigga SJ, the chairperson, Fr. Roy Sebastian SJ the director and Fr. Arulanandam SJ, the District In-charge of NJSI thanked the entire school team for their cooperation and encouraged the students to make best of the facilities that is provided by NJSI and assured them for further support.